Over the last couple of weeks, Jurassic Park has been just about everywhere. On websites. On social media. Beneath the earth, frozen in amber. We've all got Jurassic fever, and it's been wonderful. I blame Far Cry 3 for my own Jurassic fixation. That game's lush island setting is just begging for some dinosaurs. And surely news of Jurassic Park 4's 2014 release date (hopefully sans dino-human hybrid commandos) and the coming 3D re-release of the original film have both helped keep velociraptors in the zeitgeist. PC modders have really begun to dig into Far Cry 3. The mind reels at the possibilities. Whatever it is, we've all got dinosaurs on the brain. Clearly, the time is right for a new Jurassic Park video game. Let's track all the Jurassic Park stuff that's surfaced lately. First, there's this joking "ad" for Dinosaur downloadable add-on content for Far Cry 3, which, well, if they ever DO make dino-based DLC, let's hope it's this bananas. In addition to all our Far Cry 3 talk, there's this volunteer-made Jurassic Park game called Jurassic Life in the works, using the Half-Life engine. Impressive. And there are a couple of other independent Jurassic Park game-attempts out there, this one via Reddit as collected by Craig Person at RockPaperShotgun. This one's a stab at remaking the 1998 PC game Jurassic Park: Trespasser in the Unity engine by Colin Kay. It's hard to say when any of these games will see the light of day. 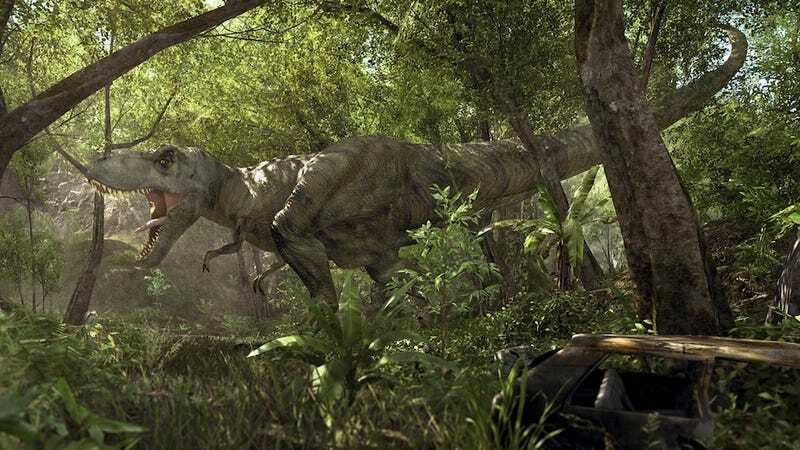 But one thing seems clear: We are starving for a good Jurassic Park game, and whoever is first to release a proper, Far Cry 3-like dinosaur adventure game will make a mint. My own Jurassic Park gaming memories mostly consist of two games. The first is Jurassic Park for the Sega Game Gear, which I played the heck out of. It was cool enough, but hardly the amazing adventure that Jurassic Park fans really deserve. Here, you can see a Let's Play by Arrow Quivershaft. Man, memories. My other memory is of reading about (yes, reading about) the Sega CD take on the series, which looked so much cooler back then than it does now. Here's NailStrafer playing it. Gah, that awful music. I never did play the SNES Jurassic Park game, though there does seem to be plenty of love for it. So I'll include a video of that, too. Here's a Lets' Play from Christopher The Knight. Those games came out ages ago. But in the interim... what a dry spell it's been. There was Telltale's by-all-accounts lackluster Jurassic Park: The Game. There was also Primal Carnage, which was more of a quick Dinos vs. Humans deathmatch game. Past those two, not much, and certainly nothing like the open-world, first-person adventure game we're all hoping for. Come on, game-makers! Jurassic Park 4 is coming out! The license is hot! My one piece of advice: Don't try to make Jurassic Park 4: The Game. Don't tie this to a film's release schedule. Use the dinosaurs, but make it its own thing. Follow the Arkham Asylum model. We've waited this long for a decent Jurassic Park game; we can wait a bit longer. The world is ready. Here's hoping the right people get together to make it happen.